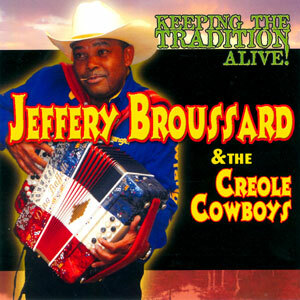 Jeffery Broussard was a leading member in Zydeco Force, an influential band at the forefront of the nouveau zydeco movement. His accordion and vocals defined this new style of Creole music, incorporating the soulful sounds of R&B into contemporary zydeco music and dance. The son of esteemed accordionist Delton Broussard, young Jeffery began his musical journey on the drums in his father’s legendary band, the Lawtell Playboys, who were themselves innovators, adding some R&B and a funkiness to this traditional roots music. During this time, Jeffery was exposed to some of the great Creole fiddle players, including the king of the zydeco fiddle, Calvin Carrière. He has retained those precious melodies and songs he heard at home, at social gatherings and on the bandstand. And with the creation of the Creole Cowboys, and as one of Louisiana’s newest Creole fiddle players, he captures the essence of this rich musical heritage. Pound for pound is an old term used in boxing. It often refers to a fighter who may not be the biggest, tallest, fastest and strongest. But judging his overall skills and abilities, he is the best boxer around – regardless of weight class. In the world of zydeco accordion players, Jeffery Broussard doesn’t have the biggest name. He doesn’t draw the biggest crowds (at least, not at home) or have the most girlfriends. But pound for pound, Jeffery Broussard is the best accordion player around. It’s an injustice to refer to Broussard as just a zydeco musician. He can play Cajun waltzes and two-steps, blues, swing, Motown and more. Some of today’s top zydeco stars have studied Broussard’s recordings or even gone to him for lessons. With the 10-button accordion that many zydeco and Cajun musicians play, the thumb on the right hand goes in a strap behind the keyboard. It helps the player hold the instrument while the other four fingers play the keys. Broussard can play with his thumb, giving him a rare five-fingered delivery on the keyboard. At one time, Broussard could play every instrument in his band – except the fiddle. But after being inspired by the young Cedric Watson, Broussard is now a fiddle master too. Broussard’s talents have allowed him to tour Russia, Germany, France and across the United States. Last month, he spent weeks on the road with gigs in New York City and along the east coast before boarding a plane and playing in California and surrounding states. Not bad for someone who dropped out of school in the seventh grade. Festivals Acadiens et Creoles offer rare chances to see Broussard at home this weekend. He’s part of the festival’s 40th anniversary concert, “From the Field to the Stage: Songs from the Lomax Collection,” at 7:30 p.m. today at Hamilton Hall on the UL campus. Broussard and D’Jalma Garnier host a Creole Fiddles workshop at 4:30 p.m. Saturday on Scene Atelier. The “Field to Stage” title is so appropriate for Broussard. Born into a sharecropping family, he left school to work in the fields with his 10 brothers and sisters in Frilot Cove, located northwest of Opelousas. Broussard spent long days digging and sorting potatoes. Music was always around as his father Delton was the leader of the Lawtell Playboys band. But when Delton was away, Jeffery would sneak into the house and grab Delton’s accordion. Jeffery taught himself to play. Jeffery later played drums in his brother Clinton’s band, the Zydeco Machine. Clinton let Jeffery play a few songs on accordion, but Jeffery was too shy to sing. With Zydeco Force, Jeffery started to sing and grabbed the spotlight. The zydeco world has never been the same and I, for one, have been thankful for it. 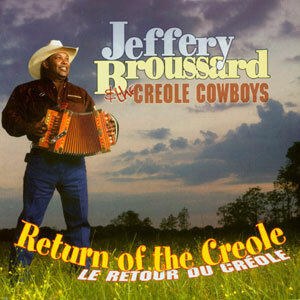 Return of the Creole is a party record, radiating all the danceable ecstasy that zydeco offers. But listen closer to accordionist Jeffery Broussard’s second solo disc and the perceptive ear can pick up a rough thumbnail sketch of the genre’s stylish progression. For instance, Clifton’s “Tante Nana” hints at simpler times when button (not piano-key) accordions were the life of that party, before revved guitars, monster basses, and the big, big beat began joining in on the fun. Or, even predating that period, back when raspy fiddles were the Creole kings, reigning uncontested over a rustic “Old Carpenter’s Waltz.” Yet, having been a key architect of the late-80s “nouveau zydeco” movement (symbolized by his Zydeco Force), Broussard is expert at surfing atop walls-of-sound. So the push is on with Buckwheat’s “Hard to Stop” and his own “Ole Blue,” slashed by cross-cut rubboards and tubular-toned electric guitars. From the swaying purity of Sam Cooke’s “Bring It on Home to Me” to the insinuating ‘toot toot’ impurity of “(Don’t Pass Ya Hand On Dat…) Make It Hot,” these Creole Cowboys pump up plenty of swirl ‘n’ stomp into their history lessons. Why doesn’t every choreographer work with a live zydeco band? The question came to mind while listening to Jeffery Broussard & the Creole Cowboys, who accompanied Elisa Monte Dance in “Zydeco, Zare,” which had its New York premiere at the Joyce Theater on Wednesday. And yet. Mr. Broussard and his Cowboys are fabulous: You start moving in your seat as soon as their rhythmic, rich melodies, both joyous and mournful, flood the theater. “Zydeco, Zare” certainly has more life in it, especially when Ms. Monte relaxes and lets her dancers have a bit of fun in the final social dance section. Still, the eyes, following the ears, traveled again and again to those Creole Cowboys. Accompaniment or no, they were the main draw. I’ve reviewed a lot of Cajun/Zydeco albums in the past, and at some point I usually describe them just as I did in the early part of this sentence combining them as Cajun/Zydeco. But it’s not just me. The people behind the Grammys recently announced a new category: Best Zydeco or Cajun Music. But in spite of a tendency to lump them together, they are still different. Zydeco is generally described as being very similar to Cajun, but with the addition of influences from Creole music. And for those who don’t know, Creoles are usually defined as black and multi-racial descendants of French and Spanish immigrants. Broussard was recently named Accordionist Of The Year at the Zydeco Music And Creole Heritage awards, and there’s little doubt that he’s the star of the show anytime his band is on stage. With his colorful costumes and trademark toothpick always in place (even when singing), he’s a real crowd-pleaser. This album is a nice mix of swamp music that’s impossible to resist, and if your toe doesn’t begin tapping then check your circulation, your foot must be asleep. Broussard leads most tracks with his accordion and vocals, but he also picks up the fiddle once in a while. The music varies from traditional, such as “Why You Wanna Make Me Cry,” to the instrumental “Creole Zydeco Hot Step,” which – in spite of its name – is evocative of pure country music, complete with some brief bits of melodies you might recognize. That track was my favorite on the album, but a tune that’s probably more representative of the album’s theme is the similarly-named but completely different “Creole Cowboy Two Step.” For this one, Broussard and his group take the traditional Louisiana dance piece and apply the band’s own Creole signature. If you already enjoy South Louisiana swamp music, add this one to your collection. If this type of music is new to you but you’re ready to take the plunge, this album is a good place to start.